I love coffee. I love finding new coffee shops and trying out great coffee roasters. 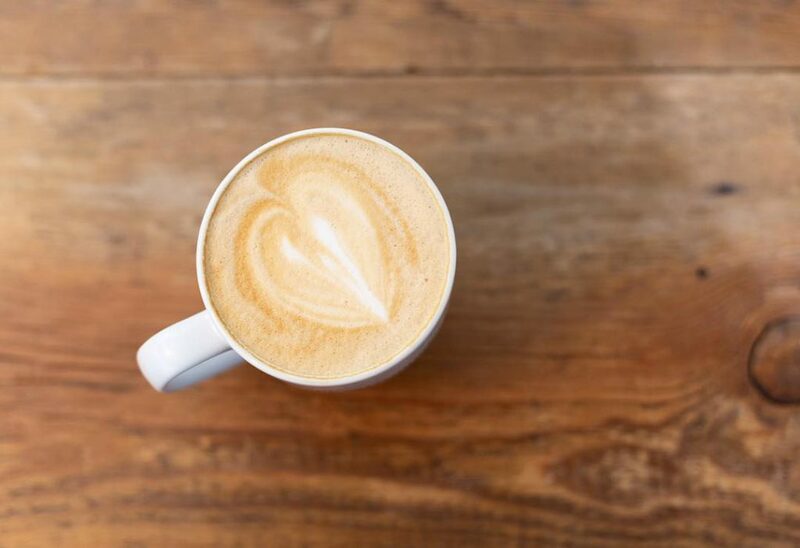 Some of my favorites are Great Lakes Coffee, Stumptown Roasters in NYC’s Ace Hotel, Red Rooster (my choice for home delivery) and my go-to local coffee shop, The Grounds. The Grounds is owned by friends and you have to love their hashtag #LoveCoffeeLovePeople. You are probably asking what this has to do with Neo4j or anything in general. Go pour yourself a cup of coffee and then come back to see where this leads. In the Neo4j Uber H3 blog post, you saw how we could use the hexaddress to find doctors within a radius, bounding box, polygon search or even along a line between locations. The line between locations feature got me thinking what if I could get use that feature and combine it with turn-by-turn directions to find a doctor along the route. You never know when you may have had too much coffee and need to find the closest doctor. Or maybe you have a lot of event data (IED explosions for example) and you want to see which ones have occurred along a proposed route. The API returns a JSON document which includes routes and legs. Each leg has a start_location with a lat and lng value and an end_location with a lat and lng value. Check the link for details on the JSON format. neoQuery = "CALL com.dfauth.h3.lineBetweenLocations(" + str(prevLat) + "," + str(prevLng) + "," + str(endlat) + "," +  str(endlng) +") yield nodes unwind nodes as locNode match (locNode)<-[:HAS_PRACTICE_AT]-(p:Provider)-[:HAS_SPECIALTY]->(t:TaxonomyCode) return distinct locNode.Address1 + ' ' + locNode.CityName +', ' + locNode.StateName as locationAddress, locNode.latitude as latitude, locNode.longitude as longitude, coalesce(p.BusinessName,p.FirstName + ' ' + p.LastName) as practiceName, p.NPI as NPI order by locationAddress;"
On the 15.5 minute drive, I would pass about 10 doctors. Now the NPI data isn’t totally accurate but you can see what is available along the route. I thought it was cool. My python code (minus the API keys) are on Github. Refill your coffee and thanks for reading. We are going to take a slight detour with regards to the healthcare blog series and talk about Uber H3. H3 is a hexagonal hierarchical geospatial indexing system. It comes with an API for indexing coordinates into a global grid. The grid is fully global and you can choose your resolution. The advantages and disadvantages of the hexagonal grid system are discussed here and here . Uber open-sourced the H3 indexing system and it comes with a set of java bindings that we will use with Neo4j. Since version 3.4, Neo4j has a native geospatial datatype. Neo4j uses the WGS-84 and WGS-84 3D coordinate reference system. Within Neo4j, we can index these point properties and query using our distance function or you query within a bounding box. Max DeMarzi blogged about this as did Neo4j. At GraphConnect 2018, Will Lyon and Craig Taverner had a session on Neo4j and Going Spatial. These are all great resources for Neo4j and geo-spatial search. Uber H3 adds some new features that can be extended through Neo4j procedures. Specifically, we want to be able to query based on a polygon, query based on a polygon with holes, and even along a line. We will use the data from our healthcare demo dataset and show how we can use H3 hexagon addresses to help our queries. For our first procedure, we will pass in the latitude, longitude and resolution and receive a hexAddress back. This returns in 17ms against 4.4 million locations. If we combine this with our healthcare data, we can find providers with a certain taxonomy. In these examples, there are no “donut holes”. If I need a polygon donut hole to exclude an area, I can pass it in as the second parameter. In the 3.3.0 release of the Java bindings, H3 included the ability to return all hex addresses along a line between two points. One could combine this with a service like Google Directions to find all locations along a route. Imagine finding doctors along a route or find all events that occurred along a route. Pretty neat, right? As always, the source code as always is available on github. This post describes how to set up Amazon CloudWatch. Amazon CloudWatch Logs allows you to monitor, store, and access your Neo4j log files from Amazon EC2 instances, AWS CloudTrail, or other sources. You can then retrieve the associated log data from CloudWatch Logs using the Amazon CloudWatch console, the CloudWatch Logs commands in the AWS CLI, the CloudWatch Logs API, or the CloudWatch Logs SDK. This article will describe how to configure CloudWatch to monitor the neo4j.log file, configure a metric, configure an alert on the metric and show how to view the logs with the CloudWatch console. Setting up CloudWatch is a straight forward process that is well-documented on the CloudWatch website. You can configure CloudWatch on an existing EC2 instance or on a new EC2 instance. CloudWatch also relies on your IAM or Secret_Key security details. Please note that in the above links. 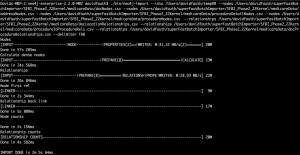 As part of the setup, you will need to configure the agent file to consume Neo4j’s neo4j.log file. In the existing EC2 instance, this is done in the _/etc/awslogs/awscli.conf_ file. In a new EC2 instance, you will need to configure the _agent configuration file_. CloudWatch allows you to configure custom metrics to monitor events of interest. The filter and pattern syntax describes how you can configure the metric. Unfortunately for us, you can only do text searches and not regex searches. For our example, we will configure a metric to look for a master failover. The steps to configure a custom metric are documented here. After selecting our Log Group, you will click on the Create Metric Filter button. For the filter pattern, we will use the text: “unavailable as master”. When you are finished, you will Assign the metric. CloudWatch provides the capability to be alerted when a threshold around a metric. We can create an alarm around our custom metric. The steps are well documented. The custom metric will show under the Custom Metrics section. You are able to name the alert, set thresholds and set the notification options. Amazon CloudWatch Logs provides a simple and easy way to monitor your Neo4j log files on an EC2 instance. Setup is straightforward and should take no more than 15 minutes to configure and have logs streaming from your Neo4j instance to CloudWatch. Neo4j has recently announced the 2.2 Milestone 2 release. Among the exciting features is the improved and fully integrated “Superfast Batch Loader”. This utility (unsurprisingly) called neo4j-import, now supports large scale non-transactional initial loads (of 10M to 10B+ elements) with sustained throughputs around 1M records (node or relationship or property) per second. Neo4j-import is available from the command line on both Windows and Unix. In this post, I’ll walk through how to set up the data files, some command line options and then document the performance for importing a medium size data set. 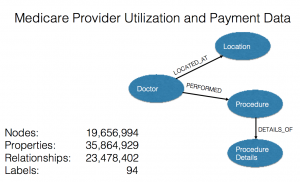 The data set that we will use is Medicare Provider Utilization and Payment Data. The Physician and Other Supplier PUF contains information on utilization, payment (allowed amount and Medicare payment), and submitted charges organized by National Provider Identifier (NPI), Healthcare Common Procedure Coding System (HCPCS) code, and place of service. This PUF is based on information from CMS’s National Claims History Standard Analytic Files. The data in the Physician and Other Supplier PUF covers calendar year 2012 and contains 100% final-action physician/supplier Part B non-institutional line items for the Medicare fee-for-service population. For the data model, I created doctor nodes, address nodes, procedure nodes and procedure detail nodes. Fields default to be comma separated, but a different delimiter can be specified. All files must use the same delimiter. Multiple data sources can be used for both nodes and relationships. A data source can optionally be provided using multiple files. A header which provides information on the data fields must be on the first row of each data source. Fields without corresponding information in the header will not be read. The header file must have an :ID and can have multiple properties and a :LABEL value. The :ID is a unique value that is used during node creation but more importantly is used during relationships creation. The :ID value is used later as the :START_ID or :END_ID value which are used to create the relationships. :ID values can be integers or strings as long as they are unique. The :LABEL value is used to create the Label in the Property Graph. A label is a named graph construct that is used to group nodes into sets; all nodes labeled with the same label belongs to the same set. In this case, the :ID is the unique number, and the :LABEL column sets the doctor type. Name and NPI are property values added to the node. The relationships file header contains a :START_ID, :END_ID and can optionally include properties and :TYPE. The :START_ID and the :END_ID link back to previously :ID values from the nodes files. The :TYPE is used to set the relationship type. All relationships in Neo4j have a relationship type. Under Unix/Linux/OSX, the command is named neo4j-import. Under Windows, the command is named Neo4jImport.bat. Depending on the installation type, the tool is either available globally, or used by executing ./bin/neo4j-import or bin\Neo4jImport.bat from inside the installation directory. Additional details can be found online. 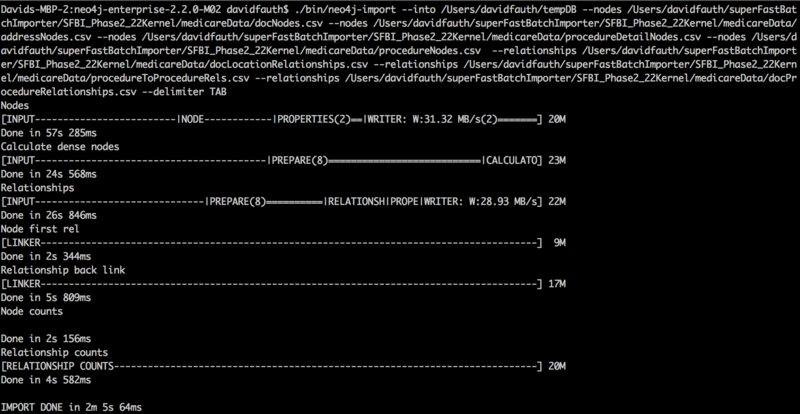 From the command line, we run the neo4j-import command. The –into option is used to indicate where to store the new database. The directory must not contain an existing database. The –nodes option indicate the header and nodes files. Multiple –nodes can be used. The –relationships option indicates the header and relationship files. Multiple –relationships can be used. Running the load script on my 16GB Macbook Pro with an SSD, I was able to load 20.7M nodes, 23.4M relationships and 35.6M properties in 2 minutes and 5 seconds. The new neo4j-import tool provides significant performance improvements and ease-of-use for the initial data loading of a Neo4j database. 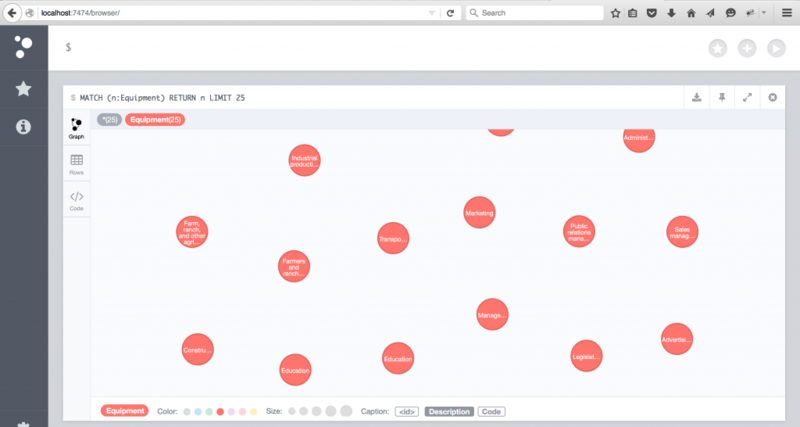 Please download the latest milestone release and give the neo4j-import tool a try. We are eager to hear your feedback. Please post it to the Neo4j Google Group, or send us a direct email at feedback@neotechnology.com. 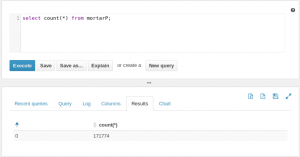 You can load Parquet formatted files into Mortar, or tell Mortar to output data in Parquet format using the Hadoop connectors that can be built from here or downloaded from here. Last year, Cloudera, in collaboration with Twitter and others, released a new Apache Hadoop-friendly, binary, columnar file format called Parquet. Parquet is an open source serialization format that stores data in a binary column-oriented fashion. Instead of how row-oriented data is stored, where every column for a row is stored together and then followed by the next row (again with columns stored next to each other), Parquet turns things on its head. Instead, Parquet will take a group of records and store the values of the first column together for the entire row group, followed by the values of the second column, and so on. Parquet has optimizations for scanning individual columns, so it doesn’t have to read the entire row group if you are only interested in a subset of columns. the command expects a proper URI that can be found either on the local file-system or remotely. Typically it’s best to use a distributed file-system (like HDFS or Amazon S3) and use that since the script might be executed on various machines. You can store the output of a Pigscript in Parquet format using the jar file as well. Store result INTO 's3n://my-s3-bucket/path/to/output' USING parquet.pig.ParquetStorer. One of the advantages is that Parquet can compress data files. 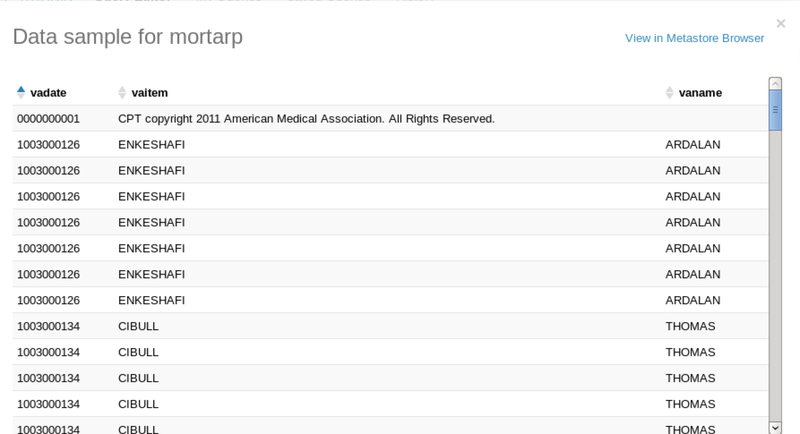 In this example, I downloaded the CMS Medicare Procedure set. This file is a CSV file that is 1.79GB in size. It contains 9,153,274 rows. I wrote a simple Pig script that loads the data, orders the data by the provider’s state and then write it back out as a pipe delimited text file and as a parquet file. With the regular pipe delimited file, the file size is still 1.79GB in size. With parquet, the file is 838.6MB (a 53% reduction in size). Another advantage is that you can take the resulting output of the file and copy it into an impala directory (/user/hive/warehouse/mortarP) for an existing Parquet formatted table. Once you refresh the table (refresh), the data is immediately available. Finally, you can copy the parquet file from an Impala table to your local drive or to an S3 bucket, connect to it with Mortar and work directly with the data. If we illustrate this job, we see that we see the resulting data sets. Using Mortar and Parquet provides additional flexibility when dealing with large data sets. The Centers for Medicare and Medicaid Services made a huge announcement on Wednesday. By mid-next week (April 9th), they will be releasing a massive database on the payments made to 880,000 health care professionals serving seniors and the disabled in the Medicare program, officials said this afternoon. The data will cover doctors and other practitioners in every state, who collectively received $77 billion in payments in 2012 in Medicare’s Part B program. The information will include physicians’ provider IDs, their charges, their patient volumes and what Medicare actually paid. “With this data, it will be possible to conduct a wide range of analyses that compare 6,000 different types of services and procedures provided, as well as payments received by individual health care providers,” Jonathan Blum, principal deputy administrator of the Centers for Medicare and Medicaid Services, wrote in a blog post on Wednesday, April 3rd. So get your Hadoop clusters ready, fire up R or other tools and be ready to look at the data. 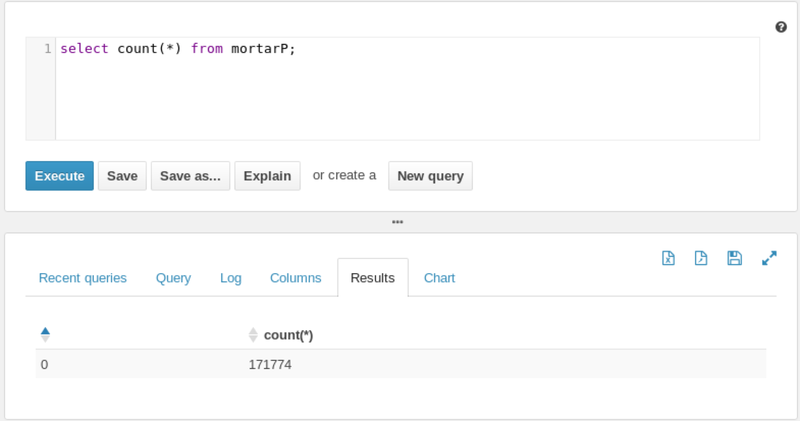 I’m starting a new series on analyzing publicly available large data sets using Mortar. In the series, I will walk through the steps of obtaining the data sets, writing some Pig scripts to join and massage the data sets, adding in some UDFs that perform statistical functions on the data and then plotting those results to see what the data shows us. FirstNPI, SecondNPI, SharedTransactionCount, PatientTotal, SameDayTotal. Again, from the DocGraph.org website, “The PatientTotal field is the total number of the patients involved in a treatment event (a healthcare transaction), which means that you can now tell the difference between high transaction providers (lots of transactions on few patients) and high patient flow providers (a few transactions each but on lots of patients)”. The Administrative Simplification provisions of the Health Insurance Portability and Accountability Act of 1996 (HIPAA) mandated the adoption of standard unique identifiers for health care providers and health plans. The purpose of these provisions is to improve the efficiency and effectiveness of the electronic transmission of health information. The Centers for Medicare & Medicaid Services (CMS) has developed the National Plan and Provider Enumeration System (NPPES) to assign these unique identifiers. The Health Care Provider Taxonomy code set is an external, nonmedical data code set designed for use in an electronic environment, specifically within the ASC X12N Health Care transactions. This includes the transactions mandated under HIPAA. The Health Care Provider Taxonomy code is a unique alphanumeric code, ten characters in length. The code set is structured into three distinct “Levels” including Provider Type, Classification, and Area of Specialization. The National Uniform Claim Committee (NUCC) is presently maintaining the code set. It is used in transactions specified in HIPAA and the National Provider Identifier (NPI) application for enumeration. Effective 2001, the NUCC took over the administration of the code set. Ongoing duties, including processing taxonomy code requests and maintenance of the code set, fall under the NUCC Code Subcommittee. 1. I can run Hadoop jobs on a large set that I can’t run on my laptop. For example, my MBP laptop with 8GB ram and an SSD can work with 73M records. However, when I start joining records and running large number of map reduce jobs, I am going to run out of temporary space on the hard drive. I can’t fully analyze the data sets. 2. It is easy to develop on my laptop and then deploy to a large Amazon cluster with a single command. The framework gives me Pig and Hadoop on my laptop with no configuration, version control through Github and the 1-button deployment. Mortar integrates easily with Amazon S3 so I can store these large data files in an S3 bucket and not worry about running out of space. 3. For debugging Pig scripts, Mortar has incorporated lipstick. 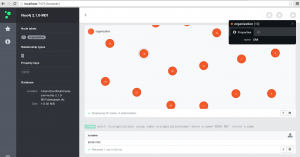 Lipstick shows what the pigscript is doing in real time, provides samples of data and metrics along the way to help debug any issues that arise. 4. Cost. 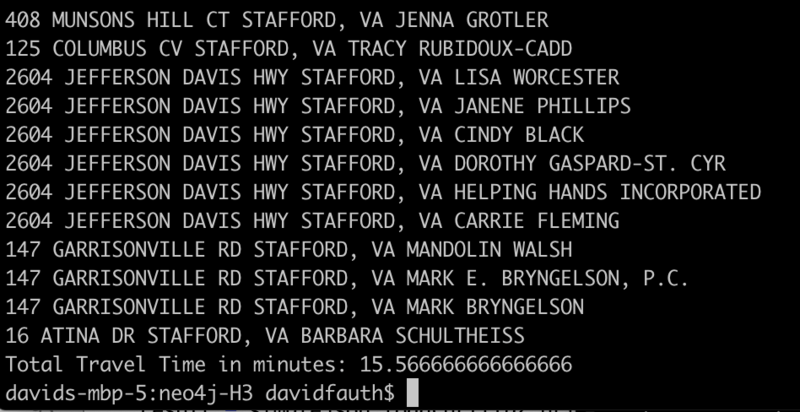 Using Amazon spot instances, I can process the data on a large cluster for less than the cost of a grande cup of coffee. Check out my invoice. 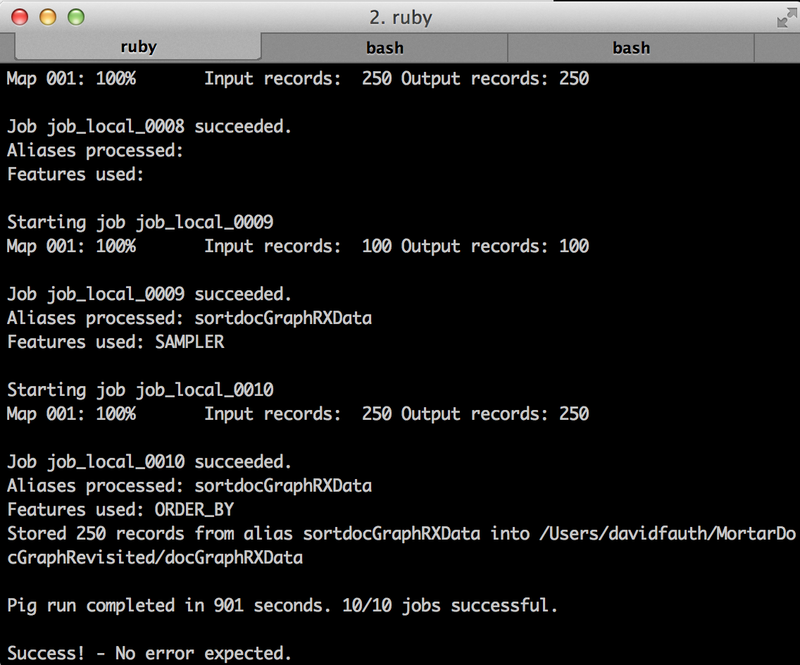 I ran an eight-node cluster for over an hour to process 73M records creating quartiles across three groups for $1.12. You can’t beat that. For more details on the Mortar framework, check out their website, their help pages and their github examples page. The rest of the post will discuss processing the data sets. 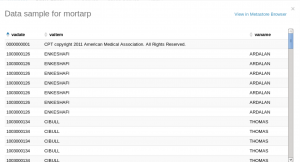 The HHS data sets are CSV files that have been zipped and stored on the docgraph.org site. In order to get information about the provider, I used the most current NPI data set (also known as the NPPES Downloadable File). This file contains information about the provider based on the National Provider Index (NPI). It is also a CSV file. Finally for the taxonomy, I used the Health Care Provider Taxonomy code set. Each of these data sets are CSV files so there isn’t any data modification/transformation needed. I downloaded the files, unzipped them and uploaded them to an Amazon S3 bucket. This data structure allows me to perform various groupings of the data and derive statistical measures on the data. The Pig code to create the structure is shown in the following gist. For this blog post, I wanted to take a look at creating quartiles of different groups of data. I wanted to group the data by referring state and taxonomy, referred to state and taxonomy and finally referring taxonomy and referred to taxonomy. For the median and quantiles of the data, we will use the Apache DataFu library. DataFu is a collection of Pig algorithms released by LinkedIn. The getting started page has a link to the JAR file which needs to be downloaded and registered with Pig. The statistics page shows us how we can use the median and the quantiles function. Both functions operate on a bag which we easily create using the Group function. At this point, the code is ready to go and we can give it a run. This job reads the data from my local machine, runs in about 15 minutes and writes out the results to my local machine. Once the job completed after about an hour, the output format looks like this. From here, we can take this data and make some box plots to look at the data. Leveraging frameworks like the Amazon and Mortar allows someone like myself to perform large scale data manipulation at low cost. It allows me to be more agile and able to manipulate data in various ways to meet the need and provides the beginnings of self-service business intelligence. Back in December, I wrote about some ways of moving data from Hadoop into Neo4J using Pig, Py2Neo and Neo4J. Overall, it was successful although maybe not at the scale I would have liked. 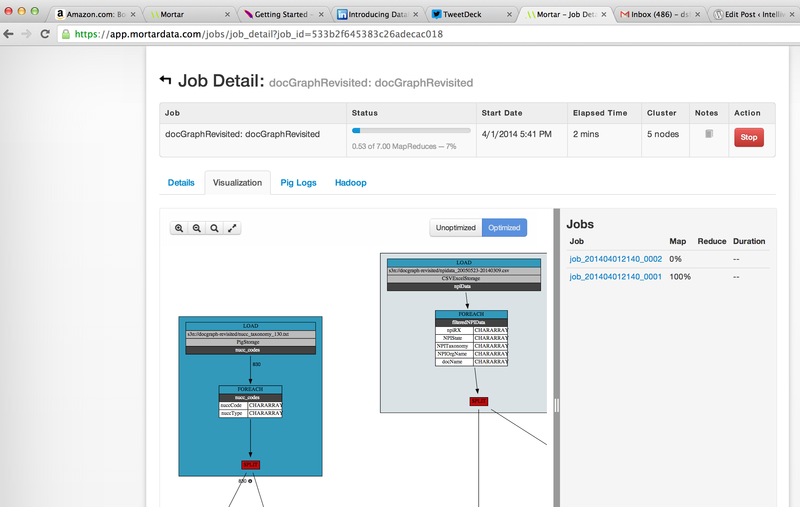 So this is really attempt number two at using Hadoop technology to populate a Neo4J instance. 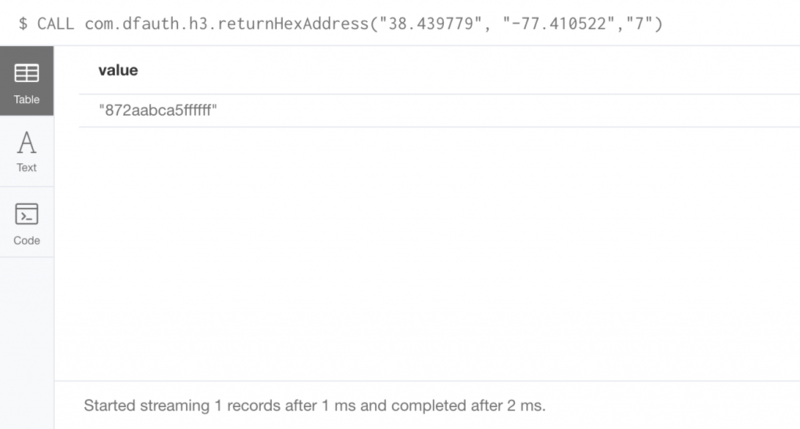 In this post, I’ll use a combination of Neo4J’s batchInserter plus JDBC to query against Cloudera’s Impala which in turn queries against files on HDFS. We’ll use a list of 694,221 organizations that I had from previous docGraph work. For this demonstration, we will use the Cloudera QuickStart VM running on VirtualBox. You can download the VM and run it in VMWare, KVM and VirtualBox. I chose VirtualBox. The VM gives you access to a working Impala instance without manually installing each of the components. After starting the Cloudera VM, I logged into Cloudera Manager and made sure Impala was starting. Once Impala was up and running, I used the Impala Query Editor to create the table. This creates an organizations table with a single c_orgname column. I had three organization list files. When I was done, I did a “Select * from organizations” resulting in a count of 694,221 records. Cloudera provides a page on the JDBC driver. 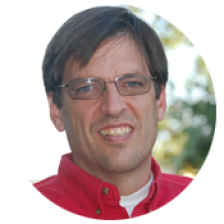 This page enables you to download the JDBC driver as well as points you to a GitHub page with a sample Java program for querying against Impala. While there are a multitude of ways of populating Neo4J, in this case I modified an existing program that I had written around the BatchInserter to populate Neo4J. The code can be browsed on Github. The java code creates an empty Neo4J data directory. 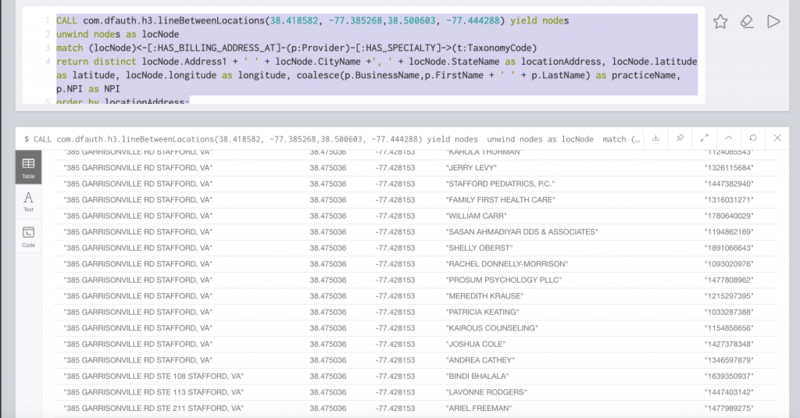 It then connects to Impala through JDBC and runs a query to get all of the organizations. The code then loops over the result set, determines if a node with the name exists and creates a node with the organizational name if the node did not previously exist. Running the program over the 694,221 records in Impala, the Neo4J database was created in approximately 20 seconds. 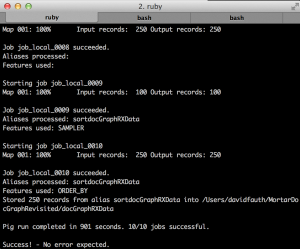 Once that is done, I copied the database files into my Neo4J instance and restarted. Once inside of Neo4J, I can query on the data or visualize the information as shown below. Impala’s JDBC driver combined with Neo4J’s BatchInserter provides an easy and fast way to populate a Neo4J instance. While this example doesn’t show relationships, you can easily modify the BatchInserter to create the relationships. ProPublica announced the ProPublica Data Store. ProPublica is making available the data sets that they have used to power their analysis. The data sets are bucketed into Premium, FOIA data and external data sets. Premium data sets have been cleaned up, categorized and enhanced with data from other sources. FOIA data is raw data from FOIA requests and external data sets are links to non-ProPublica data sets. The costs range from free for FOIA data to a range of pricing ($200-$10000) from premium data depending on whether you are a journalist or academic and the data set itself. While the FOIA data may be free, ProPublica has done a significant amount of work to bring value to the data sets. For example, the Medicare Part D Prescribing Data 2011 FOIA data is free but does not contain details on DEA numbers, classification of drugs by category and several calculations. You can download an example of the data to see the additional attributes surrounding the data. The Centers for Medicare & Medicaid Services recently made Physician Referral Patterns for 2009, 2010 and 2011 available. The physician referral data was initially provided as a response to a Freedom of Information Act (FOIA) request. These files represent 3 years of data showing the number of referrals from one physician to another. For more details about the file contents, please see the Technical Requirements (http://downloads.cms.gov/FOIA/Data-Request-Physician-Referrals-Technical-Requirements.pdf) document posted along with the datasets. The 2009 physician referral patterns were the basis behind the initial DocGraph analysis. Over the next few weeks, I’ll be diving in to this data and writing about my results.